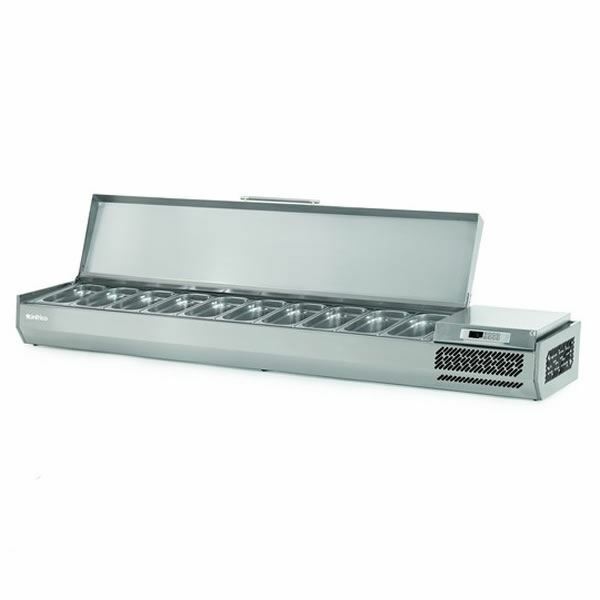 The Infrico counter top prep unit is ideal for the holding pizza, sandwich and salad items for easy food preparation. Available in five sizes the unit come with a stainless steel hinged lid over the well area. Constructed of high grade stainless steel the unit can either be counter top mounted of wall bracketed. The unit accepts 1/2 and 1/3 gastronorm pans. The unit is part of the Infrico range that also includes 1/3 GN versions and glass canopy surrounds over the well area. Infrico prep top preparation unit with solid hinged lid. Ideal for use with salad preparation, pizza toppings or sandwich fillings. Note: this unit is not suitable for overnight storage.